This carry-on kit lets you mix up a gin during your flight. Make it a smooth flight with gin & tonics for two when you carry on this personal cocktail kit. 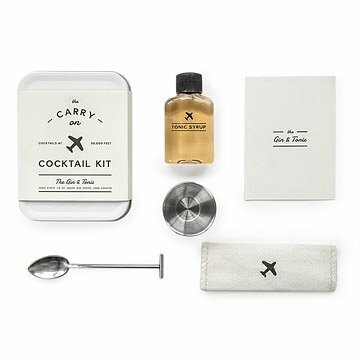 The kit will sail through security and supply you with everything you need to practice your mixology at 30,000 feet: tonic syrup, a stainless steel jigger, linen cocktail napkin, mini bar spoon, and recipe card. Just order a mini bottle of gin and a can of club soda, and mix up a couple of classic, jet-set coolers at your personal, one-seat bar. The flight-themed tin adds a dash of first-class flair to the affair. Consumables sourced in the USA; kit developed and assembled in the USA. Makes two Gin and Tonics. Alcohol not included. This item in manufactured in a facility that processes soy. My boss really did like this and that means a lot. This was a gift to my boss and he's happy so I'm happy. Got this gift for my brother and he loves his gin and fly's all the time, it was a no brainer! Upon opening and reading about your product, I was disappointed. Never used any of it - will be returning your product. What a fun way to treat my step-dad who spent his career in the airline industry and is now retired. He still travels, but hates the hassle... this is my way of saying, "Enjoy a good drink along the way!" Great addition for the beach. This was the perfect birthday gift for my friend traveling abroad. It's so small and cute! The only thing I wished it had was a mini bottle of gin, which I had to purchase separately. Still fun though! My dad loves gin and tonics, so this was a perfect gift for him for his overseas trip. Husband loved it. And we traveled the day after Christmas. Fulfilled its promise and purpose!! Got this as a gift for frequently traveling relatives - it's small, compact, and should provide a nice amusement for a long, overseas flight.